So, you’ve decided to finally build that pool you’ve always wanted. But you’ve got some questions. What kind of pool do you want to build? How big do you want your pool to be? What pool is the best fit for your family? With Levco’s experienced team of employees, you can relax and watch as your dream in-ground pool comes to fruition. Levco has been building and renovating quality in-ground pools for years, and will gladly guide you through all of the major decisions that come with the process. 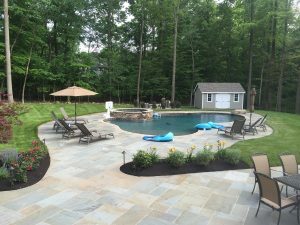 With so many in-ground pool companies in New Jersey, you may wonder what has set Levco apart from other businesses. The answer can be traced to Levco’s inception in 1986. Since the day Levco was formed, it has focused on forming a partnership with its customers and maintaining an attention to detail. Most in-ground pool companies can’t compete with the wealth of knowledge, helpfulness and hassle-free construction that Levco provides. Furthermore, Levco provides clear communication throughout every step of the in-ground pool construction process. Levco is also extremely mindful of regulations and building codes in certain areas, so that you can be sure your pool is being built within the law. With Levco’s communication and attention to detail, it has achieved (and currently holds) an A+ rating from the Better Business Bureau. When it comes to in-ground pool construction, Levco is at the top. Another reason that Levco has become the go-to source for in-ground pool construction is because of its versatility. Not only does Levco provide installations, but also renovations, openings/closings, service calls and more. Levco will even provide landscaping work to make sure your backyard is prepared for its beautiful new addition. Levco provides the same level of excellence for all of its in-ground pool construction. Here are some examples of the work that Levco can do for you. And here are some customer testimonials that speak to Levco’s reliability, cooperation and communication. 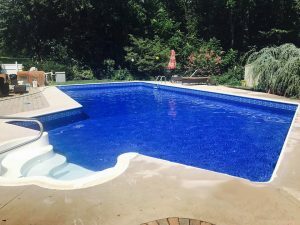 I recently had my pool re-plastered by Levco Pools and it looks great! The Levco team not only do a terrific job, but took the time to answer my questions and went out of their way to make sure the job was done to my satisfaction. The owner Shawn Nisse, is a honest business man that stands by his word and work. If you’re looking for a reliable pool company that does quality work, then you will not be disappointed with Levco Pools. I plan to continue to use Levco Pools to service my pool needs in the future. We just finished working with Levco Pools to re-surface our hotel pool and spa. I would like to compliment both Peter and Shawn for their high level of concern for our hotel during this project. They were very cooperative and explained the process thoroughly and answered any questions we had immediately. The staff that actually performed the re-surfacing work was professional, dependable and thorough through the complete process. Their cooperation with our hotel needs was much appreciated and seamless. Thanks to all at Levco Pools…we now have a pool and spa that are worthy of our guests expectations and Marriott standards! My best regards. 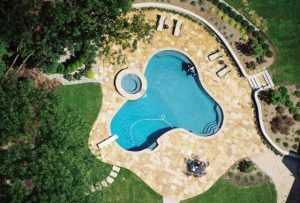 At Levco, we strive to make the in-ground pool construction process as seamless and stress-free as possible. 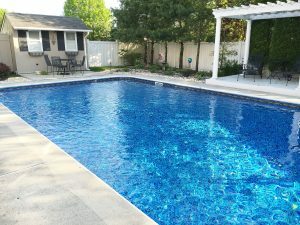 Give us a call today to begin construction of your dream pool or inquire about our services.